Flickr (among many other sites like Wikipedia) implemented a blackout today to battle SOPA. Their implementation is different though – each user on the site can block up to 10 photos, but those photos can be from anyone, not just the user’s own photos. Browsing through Explore, all photos that aren’t opted out are already blacked. Raises awareness of the issue on whole another level than if the blocking was just of one’s own photos. Well done, Flickr duderinos! Something changed on my Mac when I updated to Lion, which completely messed the color calibration of my printer when printing from Lightroom. Turns out, there was no calibration! Lightroom now has real colour calibration baked in. Wonder if I should finally splurge and get a calibration device. Completely awesome – Minecraft has reached 20 million signups. Massive kudos to the team. I guess this kills the discussion on whether Apple should support Flash on the iPhone, or not. Also I think Gruber is right in saying this is a victory for everyone. HTML5 just seems to work better on the mobile. They just couldn’t get it to work very well, and realised that getting things working was more or less a lost cause. It took years to get Flash play nice on the desktop, and it still doesn’t actually work all that well on actual computers, which have significantly more resources to spare than mobile devices. The blame for this is not entirely on Adobe, though – in my experience a large portion of Flash-based content on the web has been implemented poorly and hence tax even computers to the extreme to run. This type of Flash apps are just impossible to get running on the mobile. Additionally, content providers didn’t seem to care jack squat about optimising content for the mobile, and providing a good user experience on a site that runs poorly encoded 1080P video through Flash is just impossible on the current generation of devices (and probably the next couple gens as well), leading to embarrassing video demos of the Flash player sucking at video playback. Web-based mobile app discovery doesn’t work very well. 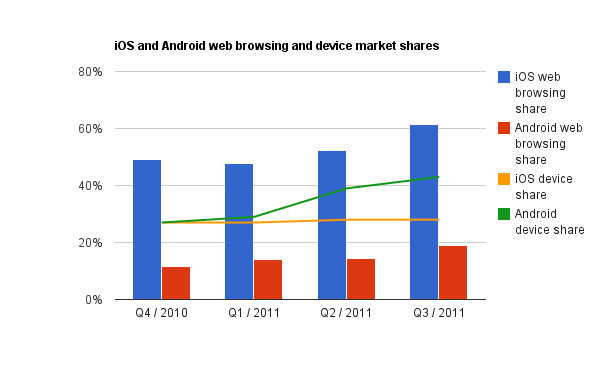 People expect to get their apps from the App Store or the Android Market. Despite a lot of effort being put onto smooth web app installation on mobile, it just doesn’t work the same as native apps. 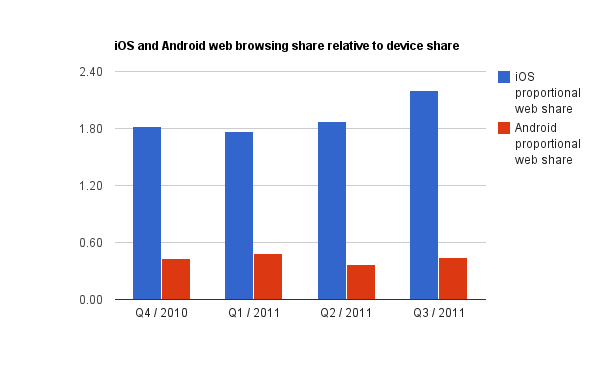 As a result, the demand for Flash browser plugin on mobile was significantly less than the demand for good tools for creating apps distributable though the channels supported by Apple and Google. So, someone Adobe just did the math and decided to drop developing an effort that didn’t have much actual demand from Adobe’s customers (you know, the developers) and which was going nowhere. This entry was posted in Uncategorized on November 9, 2011 by Sulka. 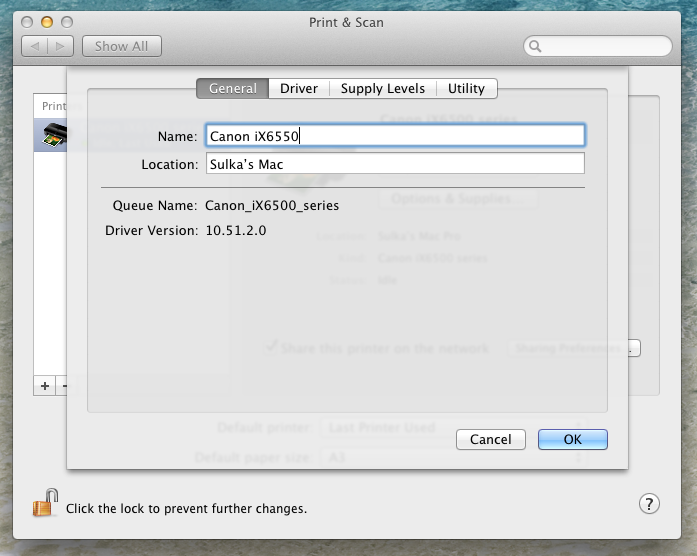 …issues have been fixed with the most recent printer driver update for OS X Lion. Network computers can print A3 to the shared inkjet. Both the host as well as the network computer needs to have the up to date software. For the client computers, you need to go to System Preferences and delete & re-create the printer after the update. You have the working driver (as of the moment of writing this) if your System Preferences says you have Driver Version 10.51.2.0, on both the server as well as the client computer. This entry was posted in Uncategorized on October 28, 2011 by Sulka. Something I’ve been meaning to blog for months: I visited Google’s offices in March, and got a bag of swag during the visit. Among the gifts was the strangest corporate gift I’ve ever received – a holographic bracelet. The reason I think this is so weird is, the holographic bracelets are magic. Mumbo jumbo, with no scientific proof they work. Google, on the other hand, is run by engineers, and prides in using algorithmic approaches – pure science – to solve problems. 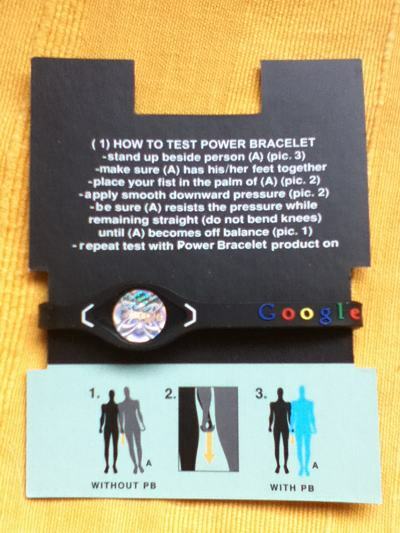 So the bracelet is antithetical to what Google represents to me as a company. And it’s a cheap Chinese item, too, rather than anything made with pride in Mountain View. Makes me wonder if the company is being run over by unscientific marketers. Guess Larry Page has some work to do to rever the course of the corporate culture that’s been emerging. This entry was posted in Uncategorized on October 19, 2011 by Sulka. 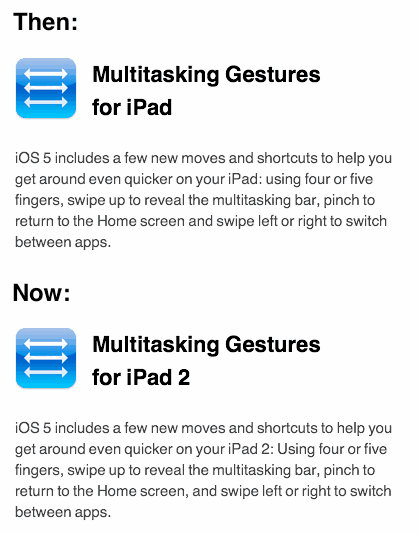 Update: It’s now being reported iOS 5.0.1 is being released soon, and it’ll add the multitasking gestures to the 1st generation iPad. Looks like people at Apple realised they screwed up, and are correcting the mistake. Case closed. One of the nice new features promoted by Apple for iOS is the Multitasking Gestures which allow you to swipe from app to app. They’ve been testing this on iOS 4 for a long time, and I’ve used them quite a bit on my iPad 1. I’ve especially been using the 5 finger pinch to exit an app, and four finger swipe up to show the app switch menu. The feature was only available to developers in the past, but became available to all users at the launch of iOS 5. Except it didn’t, Apple killed the feature on iPad 1 on iOS 5’s release version. I’m guessing this was a last minute decision on Apple’s part, since they launched iOS 5 with a page describing the features that said the features is available on “iPad”, indicating both iPad 1 and iPad 2 were supported. Apple has now silently changed the features page to say the feature is for iPad 2 only, but the UK site and other international sites are still carrying the original page. So, nice little fail from Apple’s part that’s infuriating the early iPad adopters. I can see why they chose to not support the side swipe from app to app which wasn’t 100% smooth, but it completely beats me why the pinch to exit and 4 finger swipe up were eliminated, as they simply replicated the behavior of the hardware button. So – Apple – could you please add the feature back, and give the users the choice on activating it or not, the way it used to work?